Be sure to listen to the song that this story inspired; plus, read the rest of the story: Love Is On Repeat. Since I was a boy, I’ve been told by physicians that I have a heart murmur. The doctors tried to explain how it was a sound alongside the beat of my heart. They also told me (and my parents) that it was “functional” and therefore only of minimal concern. When my wife lays her head on my chest, she sometimes comments about hearing some sort of irregularity in my heartbeat. I joked that it was purely the effect that she has on me that leads to my heart beating this way. Then, I told her about the childhood diagnosis of the murmur. I guess that it allayed our fear of the arrhythmia being a problem. Fast forward to a few months ago: I had been running to train for a half-marathon and experienced some swelling in my ankles after some of the longest runs. I scheduled a visit to a local doctor. It was my first time in a doctor’s office in my new home in Ithaca, New York, so the M.D. wanted to get a baseline on who I am, medically speaking. I noticed that he paused for longer than seemed normal with his stethoscope in a few places on my chest. At the end of his exam, he announced that a nurse would be bringing in a portable EKG machine because he was hearing an extra beat in my pulse. I told him about the murmur. 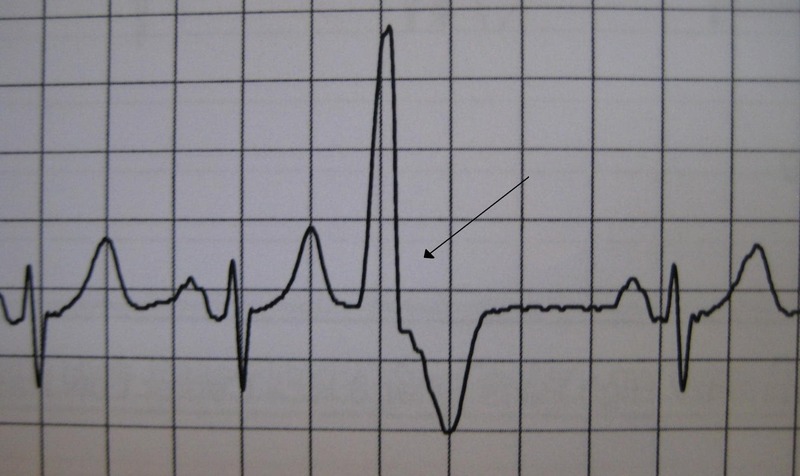 He explained that this was not a murmur, but a complete beat that was not in time with my pulse. The electrocardiogram confirmed what he had heard. My doctor told me I have an extra heartbeat. For the next few days, I was motivated by the fear that something was wrong with my heart. I reduced the length of my runs and quit training for “the half”. I modified my eating habits and drank an apple-cider vinegar and tart cherry mixture to invigorate my body systems. In my coaching sessions and conversations with friends, I talked about my fear. Next thing I knew, I was starting to see how the “extra beat” was trying to get my attention in a different way. I experimented with poly rhythms; when I went to jam sessions and drum circles I listened for sounds that seemed out-of-sync and noticed their beauty; the place of the heart as a metaphor for compassion and love took on new meanings; and I shifted my attention on the left side of my chest from a feeling of fear to a sense of curiosity and wonder. By the time my doctor’s office did their blood work and I went back for a follow-up visit, there was nothing alarming. The doctor sent me away with only a request to come back in six months. For me, an extra beat in my heart’s pulse means that I have more love to give. I get so much goodness from the wonderful people in my life. In fact, while this medical story was weaving through my life, I was improvising this series of instrumentals inspired by these wonderful people. I hope you enjoy listening. This is one of my ways of giving love back to you and the whole world. How do you celebrate and demonstrate your love? « How Will Apple Music Change Streaming? It is an amazing example of positive thinking – how you turned around the natural feelings of concern and fear about the heart condition. I really congratulate you on that and on this great post and great segue into your music. I was so embarrassed to find your comment here without a reply from me. No idea if you’ll see this AND I truly want to say thank you for your response and ongoing support. May this “positive thinking” be alive and well in your life. One thing that I love about your site, Stan, and what makes it so unique, is that you bring this truly unselfconscious view of things as it could only be conveyed by a musician. One can ‘read’ in your prose that the stuff that moves you is intrinsically connected to music. It’s almost as if your chain of thoughts rings more like a chord progression to you. I find that really inspiring and wish I had some talent to emulate it without downright copying, because, lazy bones that I am, that’s what I’d do if I could live with myself afterwards. And your tracks are also full of whimsy and poetry. Well done and thanks for that. There you go bringing your own unselfconscious opinion out into the open and thus we are like siblings in this journey. Thanks for being so consciously on it. Stan, you’re amazing. I’m awed and inspired by your perspective. This is an excellent reminder that our lives–and hearts–really are what we make them. I just tell it like it is. So glad that it works for you. Plus, your summary elsewhere on the interwebs drew my own story of this extra heartbeat together in a new way for me. I’m so grateful to you, Brenna! Plus (I’m sorry, this will be it), your Angels in Disguise brought up to memory an old song I used to listen to, by a Brazilian songwriter, Antonio Adolfo, that I’ve rediscovered recently. It’s called Notícias do Verão (something like News About Summer); hope you enjoy it. Comment as often as you like, Wesley! 🙂 I’m truly honored that my piece reminded of this beautifully crafted composition. Thanks again! Such a lovely testament to finding inspiration in whatever life throws at you. I know you’ve have to make this shift in your own life, Ami! Thanks for the artful way you continue your journey. Gosh, Stan. I haven’t heard of this. Glad you got the baseline. Now you’ll have your eye on your heart (Hmmm. that sounds uncomfortable, doesn’t it?! ), but it should help ensure a long and healthy life. You’re too young yet to experience the point where it seems everyone in one’s life has some sort of health issue! It’s weird, but sometimes David and I will be talking to friends and think, GADS—are we getting old? Health conversations can be such downers! But the beauty is, we’re all still alive and kicking. Train carefully and who knows, you might run that half-marathon, yet. Thanks so much, Terri! I just sang some songs for a hospice program, so a sense of mortality is with me again today. I hear you about friends’ medical stories. Let’s continue to focus on the goodness of life and how to make the best with what we have.